Huntington Beach, Calif. - We managed to have another rain free Sunday in HB today and it turned out to be a beautiful afternoon. 86 bikes showed up and we had a wide variety to look at. The voting was spread pretty thin across 19 different bikes, but four of them stood out enough for a notable mention. 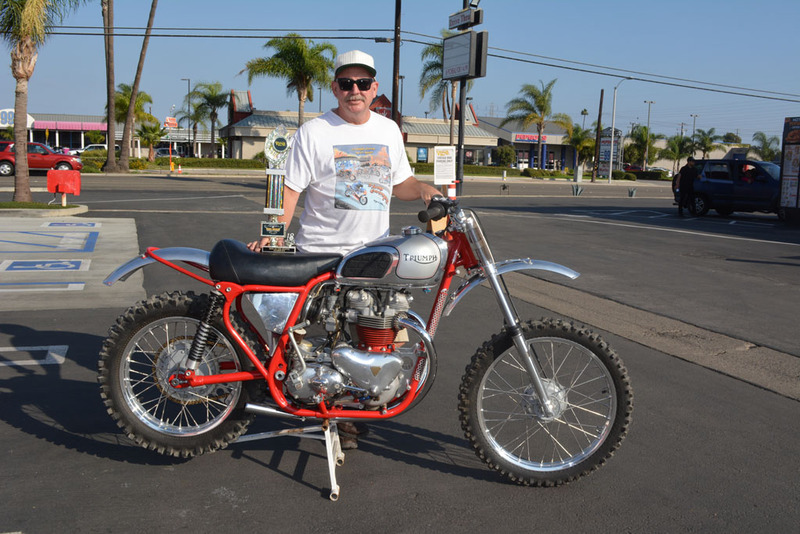 Congratulations to Randy Ressell of Westminster for winning Bike of the Month with his 1961 Triumph/BSA 650. Randy won the Bike of the Month trophy provided by Russ Brown Motorcycle Attorneys. www.RussBrown.com. And the prize goes to Eddie Crowell of Torrance. Even though Randy owns the bike, he just purchased it a month ago from it's builder Eddie Crowell. Randy plans on giving the trophy to Eddie. At 88 years of age, Eddie is still riding offroad bikes. He was an AMA racer and built this bike about 15 years ago to compete in the 70 and older age classification races. 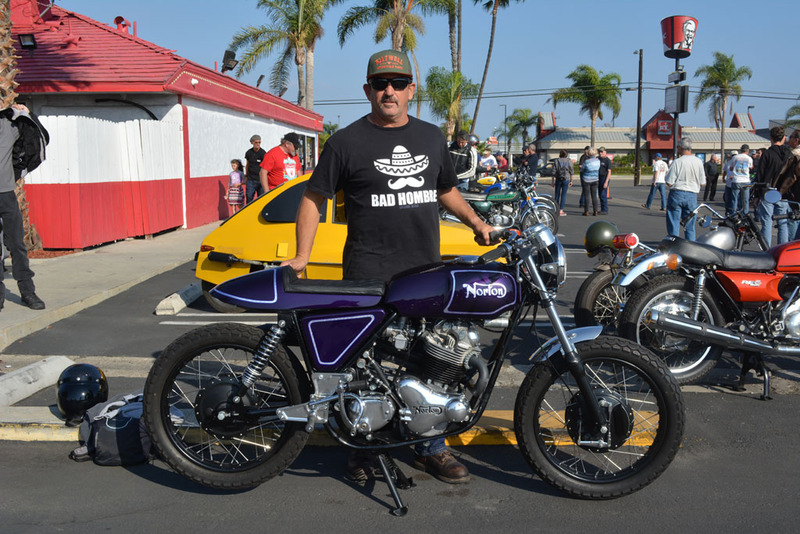 Eddie, never raced the bike but Randy plans on racing it in November in the Elsinore Grand Prix Vintage Class to help celebrate the 50th year of the Elsinore Grand Prix. Read all about the 1961 Triumph/BSA 650 on our Bike of the Month page. Vince Driscoll of Long Beach came in Second with his 1970 Norton 750 Commmando. Vince doesn't mind coming in a close second behind Randy, in fact he voted for Randy's bike. Plus the fact that he won Best of Show at the El Camino Show yesterday in Torrance. He's owned the bike since 2014 and this is the second incarnation of it that he's brought to our meet. He also placed Second with it back in November 2016. Vince won a Triumph Classic t-shirt provided by Triumph Classic Motorcycles, www.TriumphClassicMotorcycles.com. Emanual Sfaki of Silverado Canyon took Third place with his 1982 HMV Freeway. 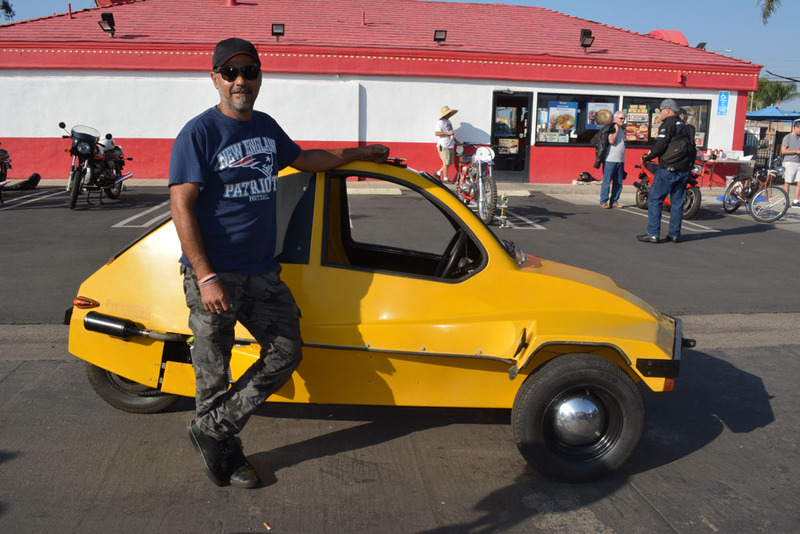 Emanual has owned this unique vehicle for 2 1/2 years. It's powered by a 250cc single out of a modern Honda 4-Wheeler. The Freeway originally came in two versions, electric or gas powered. 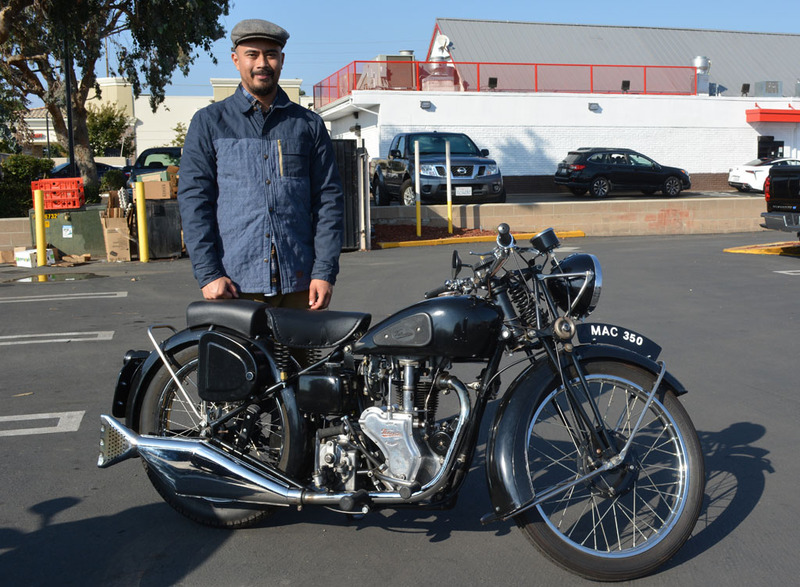 Chris Biley of Norwalk took Forth place with his 1950 Velocette 350 Mac. Chris has owned the Velocette for a year and a half, and spent the last 7 months restoring it. He's had the help of his father, Eric Biley, Mike Jungblood, Larry Luce and Craig Rich with this project. "The Velocette Dream Team". Thanks to everyone for showing up and making this another great event and a special thanks to the volunteer team, Andy Frechen, Jeff Frary, Jason Ibarra, Adam Balster and Everett Owen. Debbie and Tom were not available so I had to bring in five substitutes. I'll see you next month on November 11, 2018.